It’s official! George Lucas tied the knot with longtime girlfriend Mellody Hobson at the Skywalker Ranch in Marin County, CA, on June 22. Attendee and former Mace Windu Samuel L. Jackson tweeted, “Let’s give a Galactic shout out to Master George Lucas & his Bride Melodie on This their WEDDING DAY! Congrats!” No word yet on if any Star Wars-related elements were a part of the ceremony. Though if Lucas and Hobson did decide to infuse a little Galaxy Far, Far Away style into their ceremony, they’d have many fans to look to for inspiration. 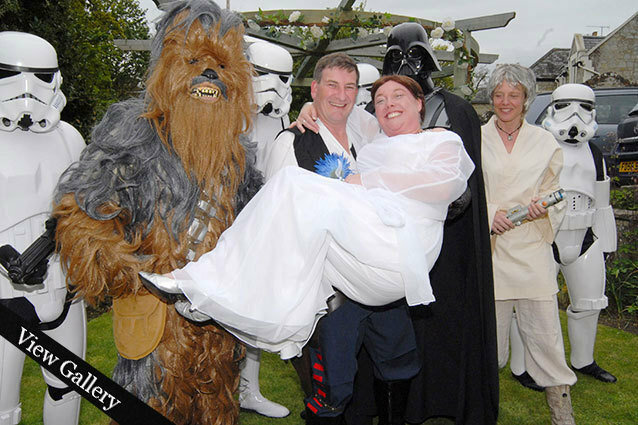 Click through our gallery of 10 Crazy Star Wars Weddings.